A friend discovered a trove of vintage sugar cubes in a butler’s pantry cupboard in an old house in Pasadena, and naturally, gave me a box. 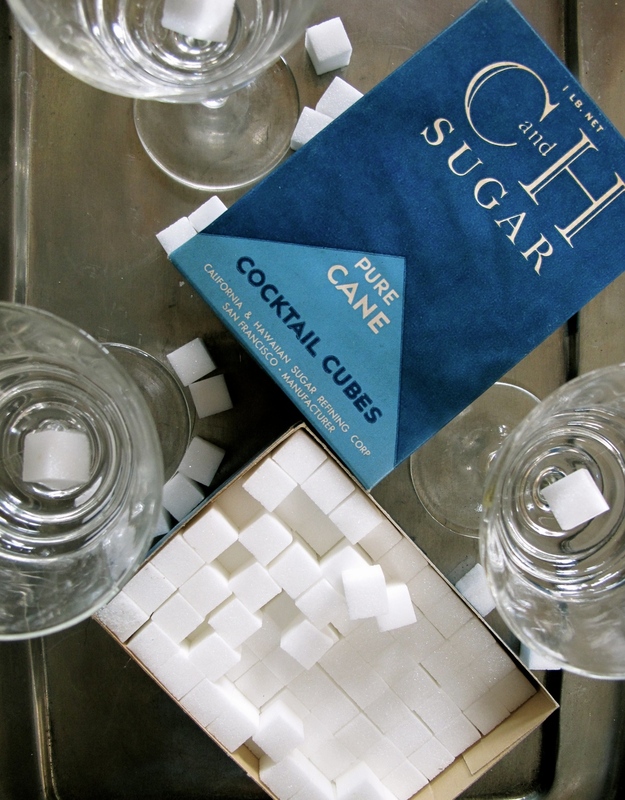 They are sweet, as not just sugary, but petite and neatly stacked in a blue and blue package labeled “Cocktail Cubes.” They are compact—a mere half-teaspoon is compressed into each snow-white cube; tiny portions of sugar for diminutive drinks. The precious C&H cubes date from the 30’s, when everything was smaller—cocktails, portions, waistlines. Have you ever watched one of the Thin Man movies of that era? (You should! They are stylish and silly fun.) The crime solving husband and wife drink all night; they can! The martinis are minute. Which brings me to my “Guide for Sensible Indulgence.” Let’s face it, during the holiday season it’s easy to overdo it. Because, you know how it can be—you see so many old friends at the party and you must catch up so you stay too late and get a tad too merry. Or you don’t know a soul at the open house and trips to the cocktail cart keep you from looking like a wallflower. Turn the tables and you’re the hostess; you want to keep your revelers reveling, yet send them home at the end of the evening with a good conscience. Following my little “Guide” will have you and your friends feeling jolly at the party and the following morning. Find pretty glasses that feel special. The coupes should have no more than a 1/3-cup capacity. Cocktails are not supposed to be supersized. Glasses with stems look party without the slightest sense of "portion control." You can find sets of vintage cordials and cocktail glasses at flea markets, in thrift shops and in your mother's or grandma's dining room.. There are tricks to make a cocktail have high impact taste-wise, without packing too much of a punch. Soda water, grapefruit juice and tea make excellent mixers that don’t dilute or over sweeten or over sour. Add interesting dashes—bitters, liqueurs, essences that make the drinker slow down and savor the mix. I have had the good fortune to imbibe a true Old Fashioned at the Pendennis Club in Louisville. It was so good, but I could only drink one and stay lady-like. Here I dilute my bourbon with a little Earl Grey tea- the bergamot blends beautifully with the smokey spirits. Run the piece of orange peel around the rim of a small glass to release the essential oils. Place the sugar in the glass and saturate it with bitters. Add the Bourbon and stir to blend. Carefully add an ice cube to the glass; add the tea. Garnish with the orange peel and serve. A lighter version of the Lemon Drop cocktail gussied up with a splash of elderflower liqueur and rose water. Combine Vodka, lemon juice, Limoncello, St. Germain, sugar and rose water in a cocktail shaker. Add a handful of ice cubes and shake to blend. Pour into a small glass. Top off with soda water. Garnish with rose petal and serve. A Negroni is cocktail of gin, sweet vermouth and Campari. A touch of grapefruit juice plays off the bitterness of the Campari and adds good citrus notes. Stir the grapefruit juice, gin, Campari and Vermouth to blend in a small pitcher. Pour over ice in a small glass. Garnish with grapefruit twist and serve.